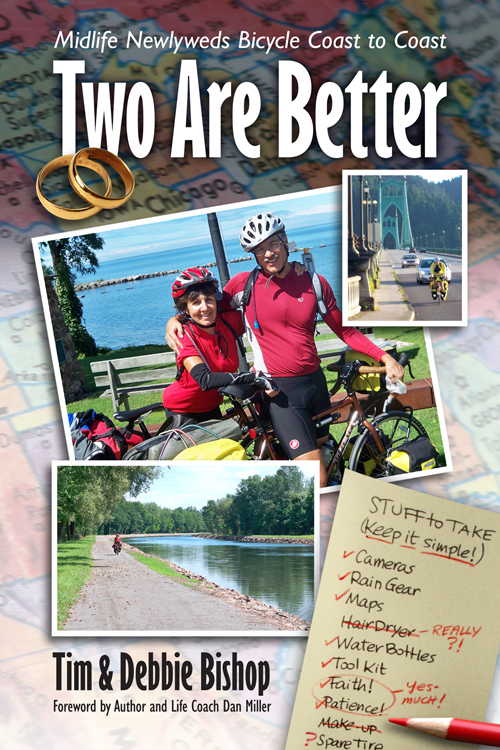 Today I will review Two Are Better: Midlife Newlyweds Bicycle from Coast To Coast by Tim and Debbie Bishop. Blurb: Have you ever wondered what it would be like to marry for the first time after your peers have already become grandparents? Have you ever wondered what it would be like to bicycle across America? As if each weren’t adventure enough, what if you combined the two? Some might consider this a recipe for disaster, but Tim and Debbie Bishop thought otherwise. At age 52, the couple finally found in each other that special someone they’d been searching for years to marry. In only ten weeks, they moved from marriage proposal and wedding, to Tim’s “retirement” and relocation, to embarking on their cycling adventure. The two were soon on their way to parts unknown and to their new life together. Tim had just retired from a 26-year career in corporate and left his familiar surroundings. Meanwhile, Debbie couldn’t wait to get their married life underway. Years of working two jobs launched her headlong into what she hoped would be a fantastic escape. What ensues is a delightful and deeply introspective memoir of not only their deliverance, but also what they hoped would be their dream trip. Was it a grand getaway or a big mistake? Over 100 color photos supplement vivid descriptions of their beautiful, newfound surroundings. When the honeymoon hits a few speed bumps, these mid-lifers must learn to adapt. Patience and a healthy sense of humor help ease them into married life. Their dual-narrative account challenges readers to pursue their own dreams and to find their own release from the humdrum that life at any age can bring. This unique and entertaining story proves it’s never too late to pursue your dreams. “Framed within a coast-to-coast biking odyssey with its daunting challenges lies a deeper and engaging view of discovering ourselves, our relationship with a loved one, spiritual connections, and answers to the nagging quest for juggling our priorities. Two Are Better will no doubt inspire you, but the fun in these pages is riding along with the Bishops.” So states early reviewer Scott Emack. The honest and open account of two mid-lifers wrestling with their calling underscores the value in reassessing goals, taking action to pursue them, and simplifying life, demonstrating that midlife and change can be friends capable of bringing one to a higher level of living. Embrace life like never before. Read Two Are Better, and begin your own quest to more adventuresome living. My Review: A coast to coast bicycle ride would be hard enough, combine that with a honeymoon. Then add in the fact that these newlyweds are 50 years old and have never been married before and you have an interesting concept to say the least. This book is has a little of everything from the discovery of love at midlife to the adventure of a cross country trip. It is heartwarming to see the relationship grow between these two people. That it is a true story is even better than fiction. The pictures add a lot to the story and make you feel like you relly know Tim and Debbie. I enjoyed the adventure and wish them lots more fun in their new lives. If you like bicycle rides and want to be inspired this is a good one for you. I give this book 4 stars. Voracious Reader · There are never enough books!